PodcastOne sent a notice describing the upcoming launch of PodcastOne Sports, spearheaded by a new show called Attack Each Day: The Harbaugh’s Podcast, hosted by U. of Michigan football coach Jim Harbaugh. To some extent, PodcastOne appears to be a reorg, and will bundle existing shows that fit into the category: The BIG Podcast with Shaq, The Dan Patrick Show, Steve Austin Unleashed, The Rich Eisen Show, and Ross Tucker’s football programs. 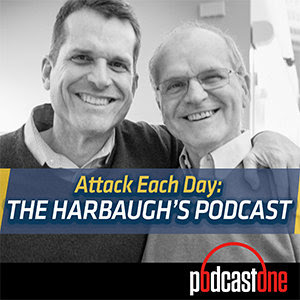 Tim Harbaugh’s new podcast drops its first episode September 5.